It's summer and we're all going on our own different adventure destinations most of the time including the beach. There are so many budget travel opportunities lately and the key to having a worry-free vacation is our ability to pack light and efficiently. Personally, I like to fit everything into a single backpack. Bikinis and summer dresses don't take up much space but footwear definitely does. I usually bring a pair of sneakers, slippers and sometimes, sandals, with me during our beach getaways because they all have their own specific purposes: sneakers for trekking, slippers for swimming, sandals for my summer dresses during night outs and fruit shake lounging. During my recent trip to Puerto Galera for Malasimbo, in the spirit of minimizing my luggage due to a long 5 day stay + lengthy commute, I decided to ditch the rest of my usual footwear entourage and just take along a pair of slippers. A decision I immediately regretted once I set foot on the island. Partly the reason why I decided not to bring sneakers with me was because I didn't want to ruin them and get them dirty. I learned my lesson from 7107. The sneakers I wore then got permanently stained from the dust and soil at the festival grounds. However, my decision to preserve sneakers proved to be a nightmare for me on our way up Mt. Malasimbo and during the entire festival. The steep incline and uneven, rocky grounds combined with my endless need to roam around caused my slippers to rip in two. Hassle. At the official launch held yesterday where the beach was brought to us in the city, the people behind Praiaz further proved why this is THE MUST-HAVE footwear brand for this season and beyond. Praiaz were born out of the desire to bring the beach to the city and marry the laidback living style of Rio de Janeiro and Paris's effortlessly chic street style. As if that wasn't enough, they also smell like either coconuts or vanilla! 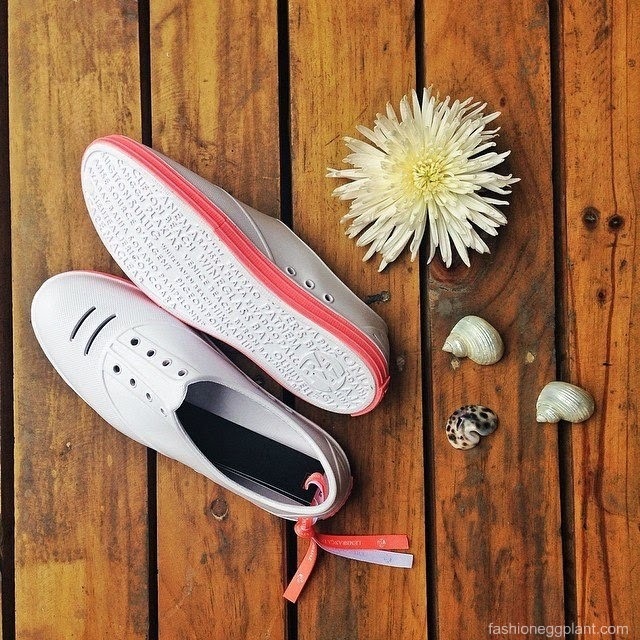 Praiaz are definitely the perfect lifestyle shoe for all adventure seekers!